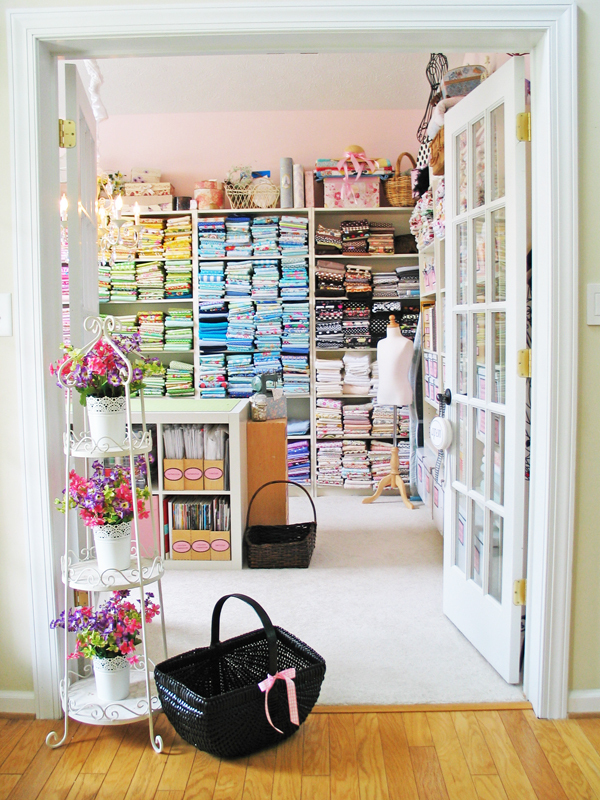 Olabelhe: Welcome To The New Olabelhe Sewing Studio! Welcome To The New Olabelhe Sewing Studio! Finally. 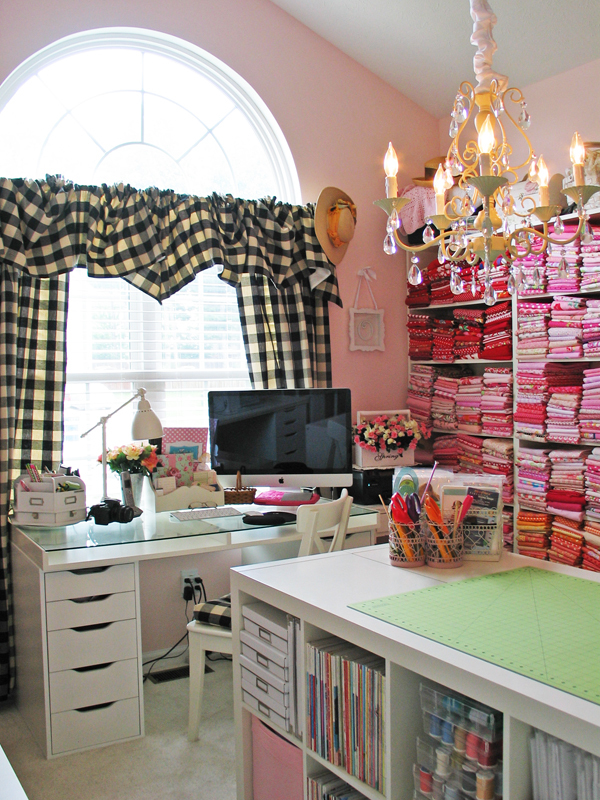 . . after almost 6 weeks of complete chaos I have my sewing studio back! I can't tell you how over the moon I am. After we got over the initial shock of the magnitude of the demolition that needed to happen to repair our home. We began to think about some upgrades that we could do at the same time. So Ole and I came up with a plan. We made the decision to close in the doorway that used to be in my sewing room which led into the kitchen. You see my studio is actually the formal dining room in our home so a pass through makes sense if you are using it for a dining room but not so much if you want to have just a tiny bit of quiet with 4 munchkins in the house. So, we decided to close up the doorway and make that wall more useable and give me a lot more space for my "stuff"! We also added the beautiful french doors to my studio so I can really have peace and quiet if I want it. I absolutely love my new cozy sewing space. I repurposed a lot of what I had before, but added additional shelves, a gorgeous new light fixture, new curtains, new carpeting and a fresh coat of pink paint. Honestly, it feels like my very own boutique right inside of our house where I get to go to work every day and still be at home with my family. 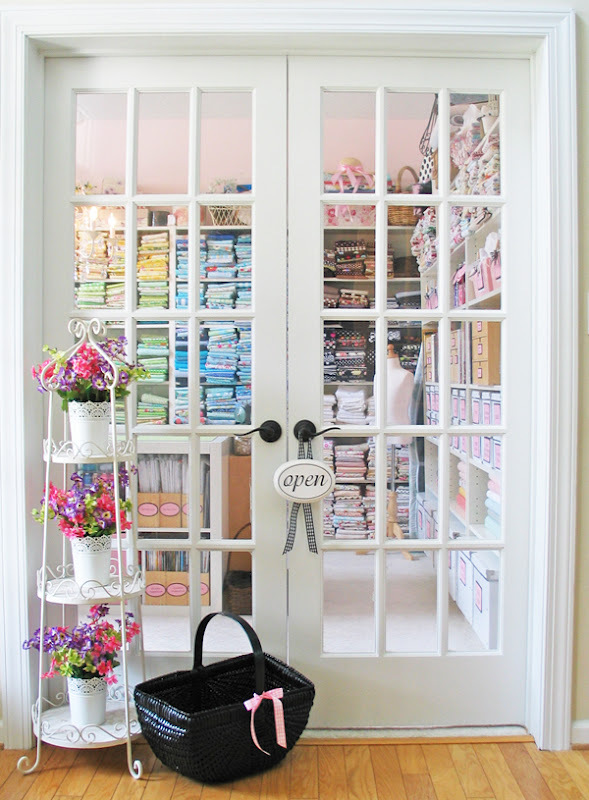 There are a few additional things that will be added in the near future like an adorable black and white striped awning over the entrance to my studio. Now to get my kitchen finished up and then life can return to normal. Just wait till you see what I did in there. We are all loving all the changes, but I can promise you it's been a ton of work. I can't tell you how much I can't wait to get back to sewing but that's going to have to wait a few more days unfortunately. This week I am testing the kids out of their grades and then a little break before we get back to school. With all the work on the house we need to do some catching up and get back into school mode. Thanks for stopping by to visit. 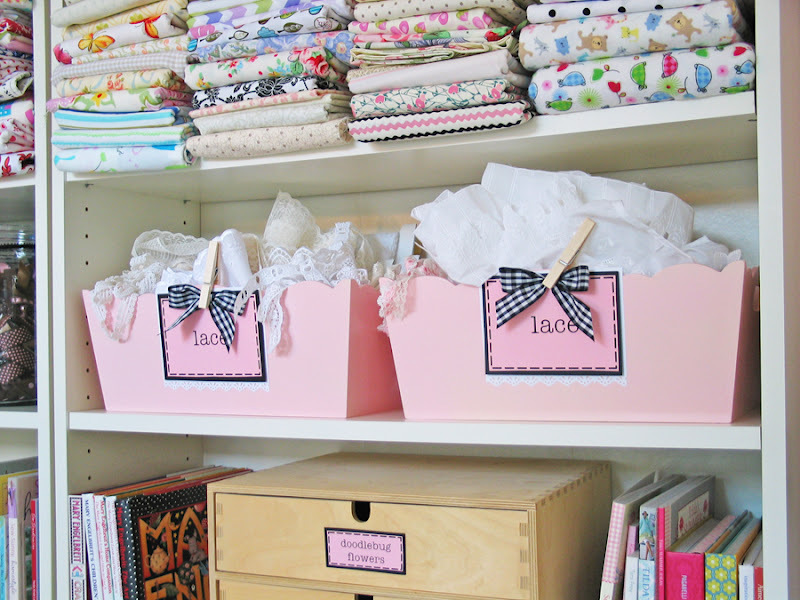 Pink bins with lace in them ~ I've had those for ages. They used to be under the kids changing table. It looks fabulous Dawn! I'm glad to get your update. I can't wait until you get back to a normal life and sewing. Do you think the awning will stick too far out into the hall or is it high enough that the tall guys will not have a problem with it? It's not going to be as big as the one in the picture : ). I've got it all measured up and I have purchased the fabric. I am just waiting for my carpenter to build the frame so I can cover it and hang it over my door. Not to worry I have it all figured out and there is no concern with it getting in the way we have plenty of room in our front foyer. It's beautiful... really, really lovely. I'm jealous. I want to come hang out and sew with you! Oh my gosh! I would never want to leave that room! It is fabulous! Its beautiful Dawn so happy for you(and a little green with envy). I think I would live in there! 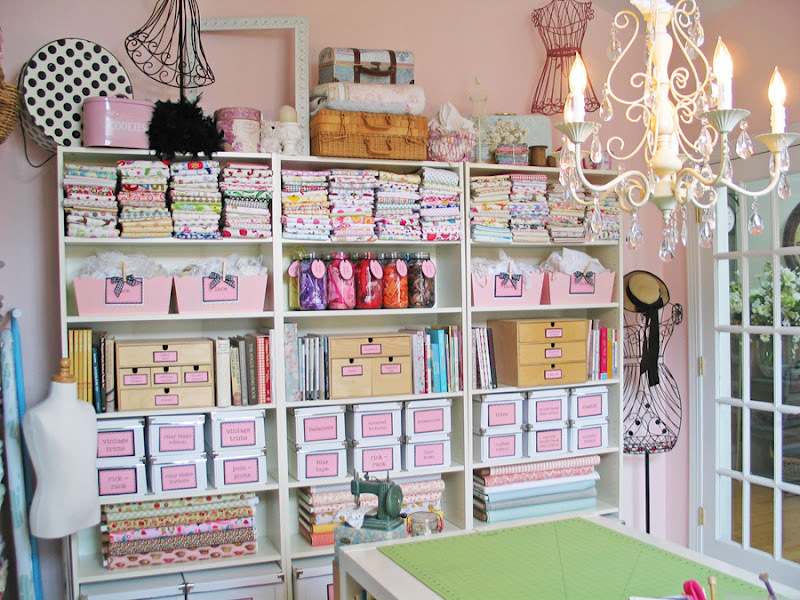 I can just imagine all the new creative ideas that will flow through your mind while working in such a creative space. I love what you've done with the place! :-) Do you happen to know the dimensions of your room? 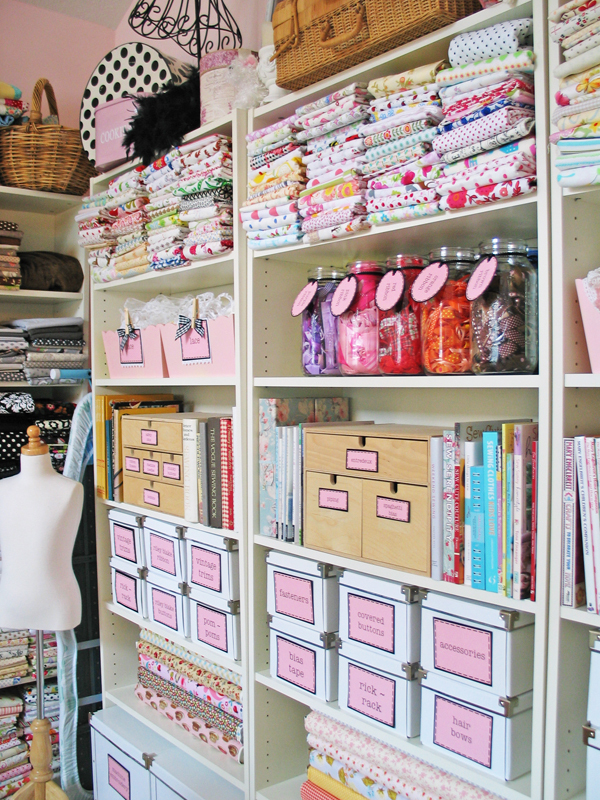 I'm trying to set up my sewing room in our 4th bedroom and I'm having trouble seeing how I will get everything to fit. My main problem is a lack of wall space, I think. But I'm definitely getting some good ideas from you. I'd also love details on what you used to make your desks. I'm assuming they are Ikea pieces? And what about your natural wood colored boxes with drawers? Are those Ikea also? I think I recognized most of the other pieces. You really have a great space and it is so well-organized. I know you will have fun sewing in there again. Your design central room is fabulous! Hope you know I'm absolutely green with envy! Enjoy it for me. Oh Dawn! It all looks wonderful! I know you were going nuts with everything in chaos but it really is fabulous! I know the awning will be gorgeous! I can't wait to see more!! It is so lovely, well worth the time spent. We have the same sewing machine, awesome, isn't it? 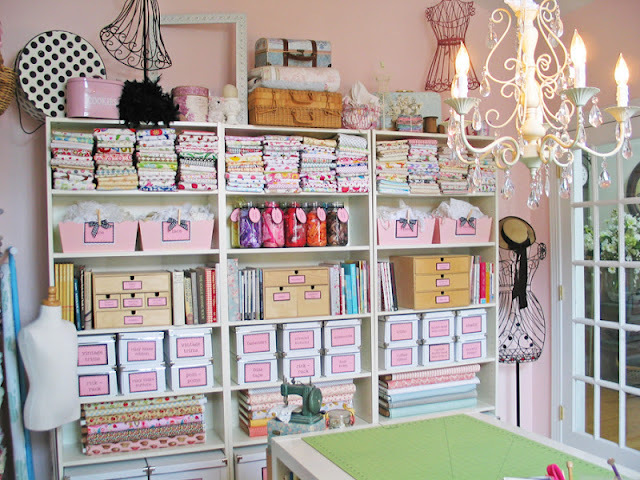 Beautiful sewing workshop, the dream of all. Bravo! It is beautiful! Enjoy your new space and all the inspiration it brings! All I can say is, Ahhhhhh! Beautiful! Wow...great studio. 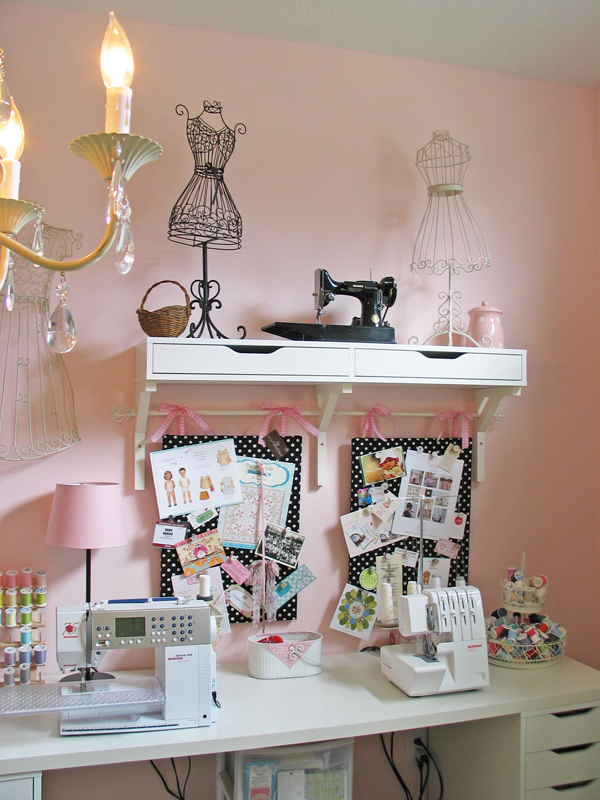 I have used the IKEA pieces in my sewing studio too. Functional and pretty too!!! 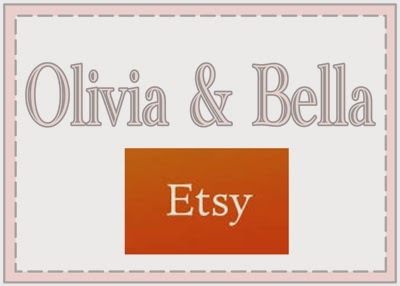 Have you checked your Olivia pattern for the error I found and emailed you about??? I would love it you could email me what size you need to cut the elastic for the arms for the various sizes. I am guessing that others who have bought this pattern will be grateful if you can take the time to answer. Have fun in your new studio....best of luck with the kitchen. Annelies, the e-book instructions for Olivia say to pull the sleeves so that the elastic is 4" to 5" long. I would use 4" for the smaller sizes and 5" for the larger ones. I've made it in a size 3 and a size 7 and that worked out just fine for me. Thank you Samantha's Mom for the help. I have to say I am so disappointed that my emails and attempts to get an answer were not responded to. 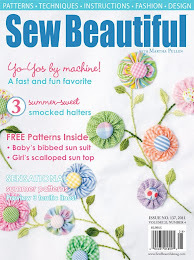 This is my second pattern I have bought.....have gotten lots of PDFs from other designers and they were so helpful to answer questions quickly. It was so kind of you to be the one to help. Cute pattern but..... I tired to send this to you in a private email, but your profile did not include an email address. I just wanted you to know I SEW appreciate your taking the time to help. Love your studio! I'm thinking about using your bookcase idea for my new cutting table since my current card table isn't doing the trick anymore! Would you mind telling me how wide it ended up being? 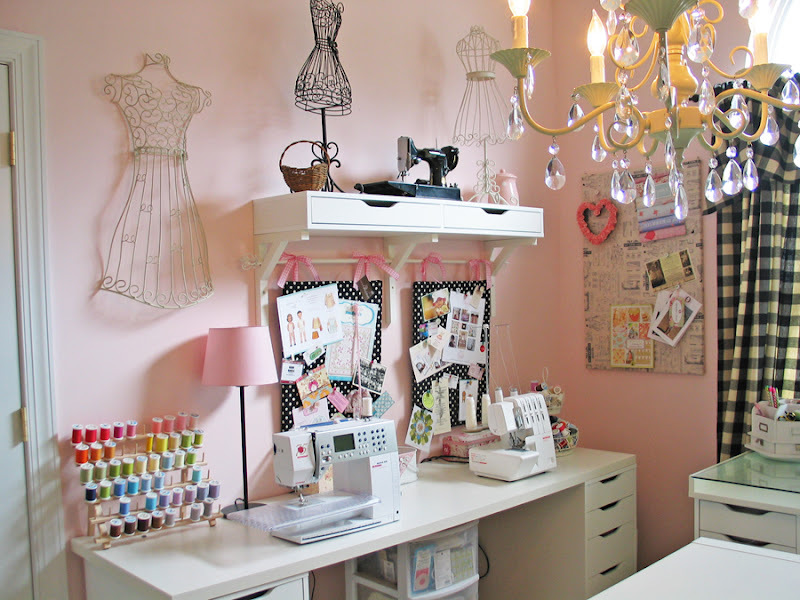 That is the most gorgeous sewing room I have ever seen in my life! Love, Love, LOVE it!!! I just love everything about it and so much of my favorite color..PINK! We just rearranged the whole house so I could have a temporary studio in the cathedral pitched den. The next step is a winterized room in the barn. Your studio gives me so much inspiration. Thank you for sharing. 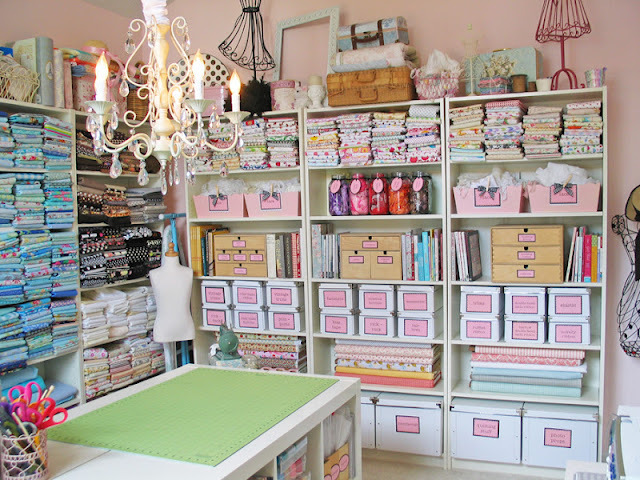 Love this room! *thud* I want to move in! Seriously, I'm transforming my formal dining into a sewing area. What color pink paint did you use? Thanks ! Love your color combination! Could you tell me what color and brand of pink paint you used on the walls? I am IN LOVE with your studio! Your studio is fantastic! I just found your photo on mychicadventure.com and did an image search to find your blog. I thought those were Ikea units on each end. 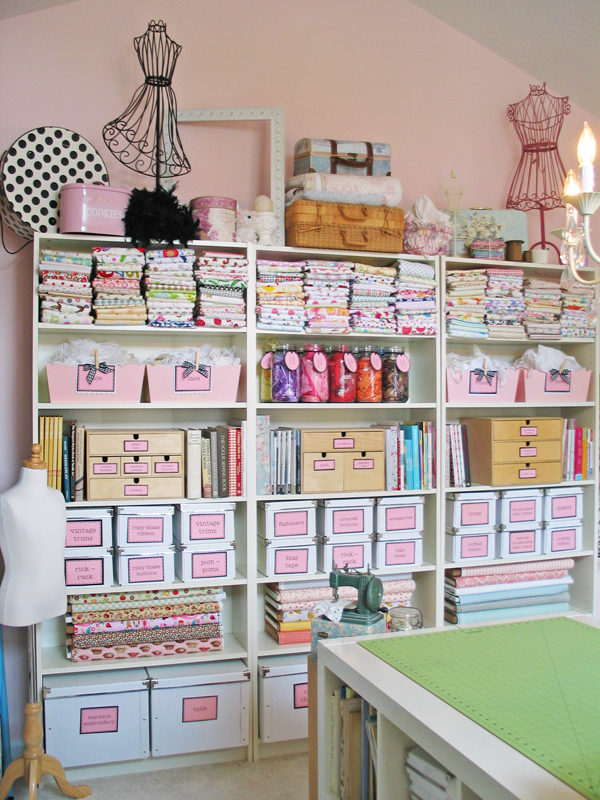 Did you have to modify anything on your sewing table, and is the top attached to the drawer units? Thanks! Oh my! 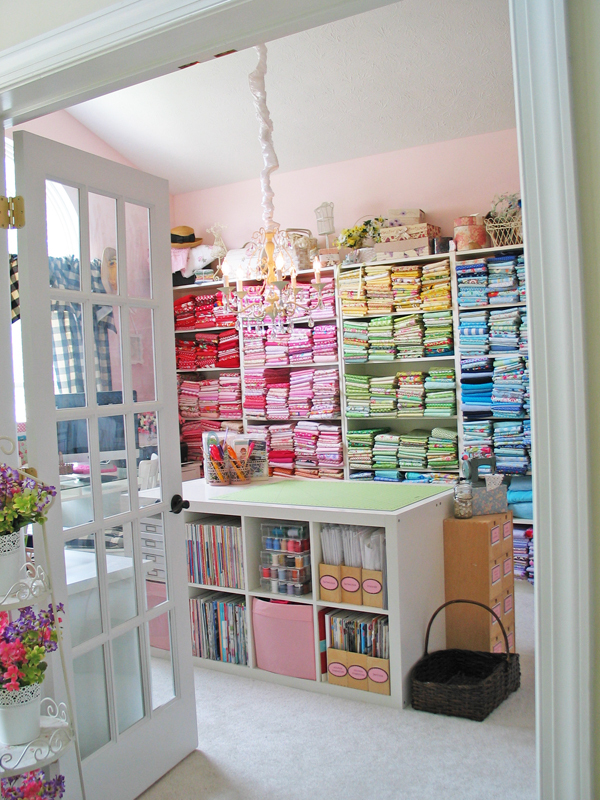 I'm in awe of your sewing room. 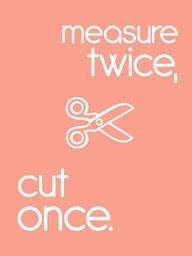 It's a seamstress dream. May I ask what color pink paint that is? I've been searching for one and can't find one I love. Dawn, all I can say is WOW, WOW, WOW! Would you come over and help me organize mine? LOL I love all the shelving. It makes me realize I have a lot of space for that. 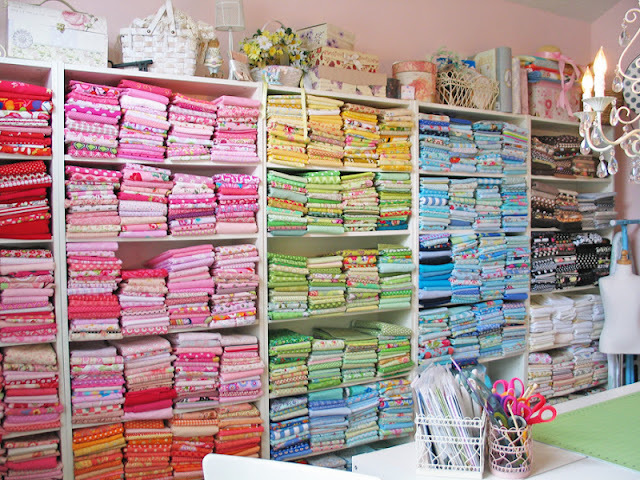 I am a quilter, so also have a longarm and need a design wall, but have some ideas for that. Thanks for the inspiration! So cute! 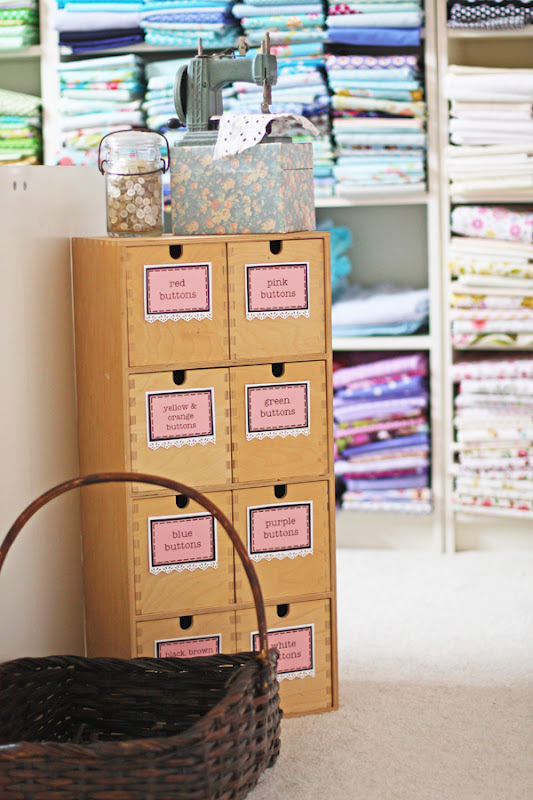 And organized! I love it! Love, love, love! Planning a trip to ikea and was wondering if the 2 drawer shelf mounted on the wall was also an ikea find? How/ where do I purchase your patterns please? Sewing is one of my true passions. I started when I was just a little girl and I have been addicted ever since. I have many wonderful memories of spending time with both my mother and my grandmother watching them sew and spending endless hours in fabric shops. 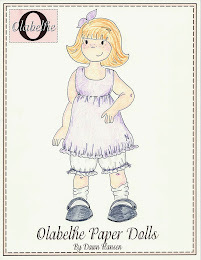 As a little girl I had a closet full of beautiful dresses all handcrafted by my mother and grandmother. I remember them dressing me up and taking me into the city for tea and luncheons all the time. What wonderful memories. Now I am a mother and my children are my pride and joy. However, my daughter is somehow special. I always wanted to continue the traditions I grew up with and now I have that opportunity. Abby, who is currently ten, loves to go fabric shopping with me and help me pick out pretty fabrics. She will sit next to me while I sew and happily play with scraps of fabric, my button box, tape measure, and spools of thread for hours. When she was 3, she would go into my stash and pick out a piece of fabric and bring it to me and say.."sewing machine it mommy!" I will treasure these memories forever and I hope that she too will someday learn to love to sew like her mama, grandma and great-grandma. I have received a ton of emails from people curious about the name "Olabelhe"! Way back when, when I decided to start a blog and a small business I wanted to have a very special and unique name that people would remember and that meant something! Since my inspiration comes from the most precious thing in my life...my children...I wanted "my name" to somehow reflect them. Hence, the birth of Olabelhe. This made-up word comes from the first 2 letters of all 4 of my children's names. OLiver, ABby, ELliott and HEnry! Pretty clever huh? I just love it and indeed, it works. The content of this website is the sole property of Dawn Hansen. Please feel free to link to this blog, but please respect my hard work by not removing or posting any of it's content without consent. All my designs are original as well as my photography and both are property of Olabelhe. Thank You!